Heteranthera limosa (Sw. ) Willd. 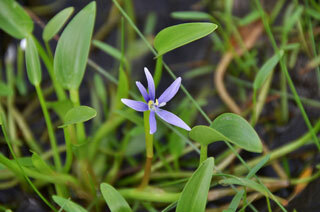 Also Called: Blue mud plantain. Stems: Tufted; rooted in mud; stems submersed, elongate or emersed, contracted; erect or creeping, glabrous. Leaves: Basal rosette leaves sessile; blades linear to oblanceolate, 1.4 to 2.4 inches long, 1/8 to 1/5 inch wide; stalked leaves erect, standing out of water or blades floating on surface; stalks .8 to 5.2 inches long; blades ovate to elliptic or elliptic-lanceolate, .4 to 2 inches long, 1/6 to 1.3 inches wide, firm; base truncate to wedge-shaped; tip rounded to pointed. Inflorescences: Solitary flower at tip of flowering stalk 1-10 inches long; sheathed by spathe; spathe .4 to 1.8 inches long, folded, long-tapering, glabrous. Flowers: Perianth salverform; top .2 to 1.2 inches across; tube .6 to 1.8 inches long; perianth lobes 6, linear-lanceolate, .2 to .6 inch long, white or light blue or purplish-blue; base of upper lobes light yellow at base; stamens 3, unequal; lateral 2 short, yellow, central one longer, pale blue or yellow. Fruits: Capsule, cylindrical, to .8 inch long, retained in spathe; seeds numerous, 1/50 to 1/16 inch long, longitudinally ribbed. Habitat: In shallow water or mud, stagnant water, pond edges, roadside ditches; erratic occurence from year to year. Comments: The flowers open soon after sunrise and wilt by mid-day.